I was maybe nineteen or twenty when I visited Portugal. I spent two weeks there with a few friends in a small coastal town, the name of which escapes me now. We were guests of another friend of ours from South Africa who had been visiting his parents. Each morning his dad would wake us long before the sun rose and we’d go to the markets to buy fresh fish and fruit and vegetables for their supermarket. The trip in their old utility truck alone was an experience and a half. I also met a girl there and we enjoyed a moment that stayed with me a long while, even after I returned to Israel. Portugal was a lovely place, even Lisbon. Modern and old–all at the same time. You saw its history in the old buildings and statues and narrow cobblestone roads. You saw it in the ornate archways and thick, timber doors lovingly crafted from an era when pride and time were plentiful. On our way back we slept in Lisbon airport on the floor, using our backpacks as pillows. I feel old thinking back. Where am I going with this… Uhm, oh, our artist hails from Lisbon, Portugal. Inkognit aka João Fiuza specializes in creature design, fantasy illustration, and concept creation for the game and movie industries. As an artist, João believes in pushing not only himself but also existing boundaries in order develop and move forward. And It makes perfect sense. Below is a sampling of his work. Each image links back to the site of origin. Enjoy! João is young but wields his talent like a berserker wields his bearded axe. I’m blown away by his ability with texture and how he combines it with a dark, earthly palette that utilizes bright, glowing tones to dramatic effect. His paintings incorporate both vague and minute detail and it forces you to focus on a scene to take it in fully. He is yet another artist I wouldn’t mind commissioning for a cover. Let me know your thoughts below. If you’re in the mood for some science fiction art, I’m featuring the top twelve most viewed posts over on Kōsa Press. And lest I forget, there are only three days left of our $100 Amazon Gift Card Giveaway. So, if you want to stand a chance to win something that will let you buy plenty of books, enter here. 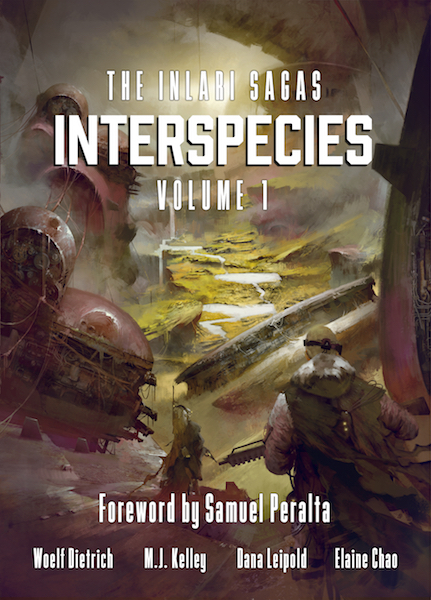 < Previous Interspecies, Volume 1, The Inlari Sagas Available Now! Such a fantastic sense of evocation. I really like the atmosphere of these pictures, even more than the subjects themselves. Agreed. I think the textures contribute to the overall ambiance.